Check back soon for reflections about the season of Lent written by the 4th, 5th, 6th, 7th and 8th graders! Even if your child is too young to write words or sentences, they can still tell you stories. As they describe a something that happened during their school day or something funny they saw, jot down their tale. This way they practice retelling events in a logical order, which can help when they begin to put their thoughts and ideas down on paper themselves. Hello! 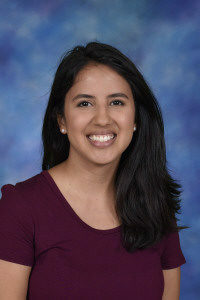 My name is Bryanna Gómez and I am a teacher here at St. Giles School. This is my fifth year at St. Giles. I am a Resource Teacher for all grades. Previously, I taught Spanish to the Primary grades. I also work in the Kids Klub after-school program here at St. Giles. I graduated from Concordia University Chicago in River Forest, Illinois with a degree in Elementary Education. I am currently pursuing a Masters degree in Reading Education. Looking forward to a fantastic year!